Are you looking to fundraise, celebrate a corporate milestone or simply boost company morale? 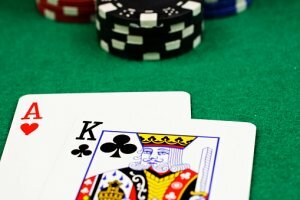 Why not host a casino theme party? It’s a fun way to bring together colleagues and community members of all ages to play blackjack, Texas hold ‘em, roulette and other casino-themed games. Parties can be daunting, there’s no doubt about it, especially when you’ve never planned one before. A lot of careful thought goes into the planning and execution of every detail, and a casino theme party is no different. At Entertainment Unlimited, we know a thing or two about pulling off a successful event. We’ve been at it for more than 50 years, after all. We’re one call away from making your upcoming casino theme party the talk around town. First, we’ll help you determine your budget and guest list. How much are you able to spend? We’ll prioritize the list of items you’ll need. Perhaps a fire hall is sufficient, but you want the best DJ available. That kind of thing. Next, find and secure a venue based on the size group you want to host. Here at Entertainment Unlimited, we have relationships with venues all over Pittsburgh. We can help you select the perfect venue for your casino theme party based on your budget, location, parking, time of year, etc. Select a date! Keep in mind other events going on in the community so you don’t have competition for venues and guests and parking. Weekends are best, preferably after payday. We have a finger on the pulse of the entertainment industry, which means we know the tricks of the trade and the best kept secrets, such as venues you might not have known about. Hire or secure volunteers to be DJs, dealers, waiters, valet parkers. These key individuals will be pivotal the day of your event. Don’t underestimate their contribution. Send out invitations. Make sure your guests have plenty of time to plan and make arrangements so they can attend your casino theme party. Prep for the event. Rent or borrow game tables, roulette wheels, chips, cards, etc. Decorate in keeping with your theme using linens and signs. Obtain or order food and beverages. If the budget allows, consider parting gifts for your guests. Reach out to Entertainment Unlimited to help you plan your casino theme party. We can help you avoid pitfalls and ensure a successful, memorable event.